From the post World War II era to the emergence of personal computers in the early 80s, one technological wonder was at the core of domestic bliss: the television set. We have given it a number of names – from TV to “the tube” or simply “the box” – testifying to our long time relationship. For most of us, our awareness to the world and reality as well as our imagination has developed in front of the television set. TV has been and continues to be much more than a mere screen. It brings us entertainment, information and education. “Do Not Adjust Your Set!” presents an extensive selection of television sets from the Cinémathèque québécoise’s Moses Znaimer collection. Rather than presenting the technical and design evolution of the television set in a chronological order, we have chosen to go back in time, starting from space age models and working our way to initial experimentations in mechanical television receivers. How does a colour tube work, exactly? What happened at the 1939 World’s Fair? And did you know that television in Canada started in 1931? Discover one of the great iconic objects of the 20th century through some of its most outstanding specimens. 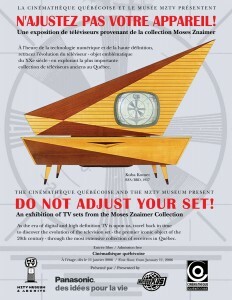 This exhibit is on display at the Cinémathèque québécoise in Montréal.